The Online Citizen speaks to 22-year-old Alex Zhixiang Tan. He has been leading the onslaught on the YPAP Network Facebook Page, advocating for transparency, accountability and compassion for citizens in public policies. 1. Would you like to introduce a little about yourself? I grew up in a low-income HDB-dwelling family in Tampines. My mother raised me up single-handedly. She worked as a coffee-shop cleaner during my schooling days. At the age of 14, I started working while studying to lighten my mother’s burden. She had taken 2 job-shifts as a cleaner to support the family. She worked from 6am to 11pm. She has been an inspiring figure and her workaholic-attitude had rubbed off onto me. There are many poor Singaporeans like me. We work very hard everyday but we see little or no hope of getting out of the poverty trap. Other than growing up poor, i guess im just a typical Singaporean born and bred here. 2. What is your motivation behind engaging the YPAP Network Facebook Page? Recently, the People’s Action Party has been calling on Singaporean youth to engage the government. Being fearful of the unknown, it is perceived that joining YPAP would be an insurance against any potential backlash. Irrational as it sounds, this notion of better safe than sorry is deeply rooted in many youths’ minds. 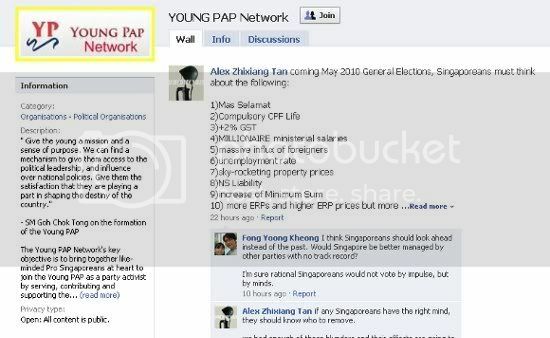 These youths are entitled to feel the fear given PAP’s almost flawless record of winning defamation suits. I joined the YPAP Network facebook group because i want to challenge the members there to ponder (a) if serving PAP is equivalent to serving the country; (b) if every PAP policy is backed by good intention, pragmatism and most importantly formulated to serve the People’s interest; (c) if the words of PAP leaders are of gospel truth. I think many youths joined YPAP because (a) they don’t know what YPAP is like (e.g. Nominated MP Calvin Cheng); (b) they think they will be protected if they make negative remarks about the PAP; (c) they honestly believe they can reform PAP from the inside; and (d) they just want to network. Heavy censorship in Singapore tends to boost the presence of propaganda in the mainstream media. It is unavoidable and Singaporeans have no control over it. I do not want to see online news media to be tainted by propaganda as it is the only source of reliable information about Singapore. Hence, I take a pro-active stance by questioning the PAP’s policies in the lion’s dens. In doing so, I implore present and new PAP members to reassess their beliefs and opinions independently, and not simply rely on model answers provided by the government. My persistence is motivated by the fear about Singapore’s future. It looks very bleak now, under PAP’s existing policies. i have no political affiliation. The only encounter I ever had with a PAP MP was receiving an award from Finance Minister Tharman Shanmugaratnam. My disapproval of PAP is solely due to PAP’s inability to answer my simple questions satisfactorily. 3. What do you think are the three most important issues that are facing Singapore? I think the most important issue is the high influx of foreigners, followed by the standard of living for the elderly and the poor. The third most important issue is incapable leadership. 4. What do you look forward to see in a political party’s manifesto? A political party’s manifesto are merely aspirations to me, just like what the Singapore Pledge is to Minister Mentor Lee, especially if the manifesto is implemented in a similar way of how democracy and freedom are implemented in Singapore. 5. Do GE candidates of minority races need affirmative action to be elected? 6. Did you find National Service a productive time of your life? National Service is a complete waste of my time. It isn’t meant to be productive since its intention is rooted in fighting a war. If National Service cannot be abolished, then it should be implemented for all Singaporean citizens. Females should not be spared. Female citizens can serve as nurses in our foreigners-dependent government hospitals and learn a thing or two about motherhood and healthcare. Their services will be exceptionally useful in times of crisis where fatalities and injuries are high. while foreigners would have abandoned Singapore. Our medical bills would be cheaper somce female conscripts’ pay would be very low. Ministry of Health may offer interested female conscripts to sign-on, just like the Singapore Armed Force. Re-service should be abolished because the economic interests of NSmen are not as adequately protected considering the level of sacrifice and risk NSmen are subjected to while protecting the nation. If re-service cannot be abolished, a tax on non-NS-serving workers (including Singaporean females and foreigners) should be introduced, so that they will not take our peace and security for granted. This tax may be used to fund the wages of National Service conscripts or supplement the Defence Budget. National Service should be seen as a citizen’s privilege with exclusive benefits. Instead, NSmen are currently disadvantaged for putting the country’s security interest above their own interests. 7. What is the role of youth in shaping the development of our country? Youths can shape the development of Singapore by taking simple steps such as asking questions. While some of the questions may sound idealistic, they actually demonstrate the gap between existing policies and the ideal. If PAP fumbles with a simple question such as when ordinary Singaporeans can retire, then we know there is a problem. Being a private tutor for 4 years, I have come across youth apathy frequently and I blame the Singapore media and education system for that. Youth wing members of political parties should be cognisant of their personal values and ask themselves if joining the political party actually reinforce their own values. The values of youths, particularly those at the lower age range, are still at a development stage. The affirmation of their values are not yet cast in stones, so the responsibility of the youths’ awareness actually lies in the respective youth wings. I hope the youth wing members of all political parties will always put Singapore first before their own political party.